Paul Lee registered his second Cignal-PBA Press Corps Player of the Week award after leading Magnolia to back-to-back victories en route to securing a playoff spot in the Commissioner’s Cup. Ginebra shooting guard Scottie “The Hustle Man” Thompson knows a thing or two about working his way to the top. 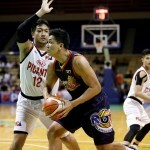 At 24 years old, he is playing for one of the country’s most loved basketball teams and is already making a mark that he’s been dubbed one of the PBA’s fastest rising stars. Is it time for Ginebra to bring back Brownlee? 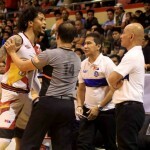 Renaldo Balkman got his wish to redeem himself with the San Miguel Beermen, replacing an ineffective Troy Gillenwater. For those who have been following the PBA drama, this was a foregone conclusion. 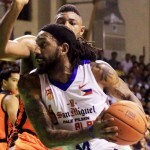 Renaldo Balkman’s lifetime ban is lifted although there is no clear picture as of yet on where he will play. Unless the unthinkable happens, the safest presumption right now is to see him land on one of the San Miguel Corporation squads. So far, the attention over at the Barangay Ginebra camp is the return of Greg Slaughter. 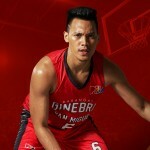 “Gregzilla” returns to action Saturday (Feb. 3) against the dangerous NLEX Road Warriors but his playing time will be controlled. 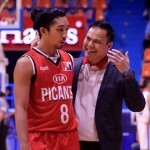 Kia Picanto finally got on the win column, ironically also the first win for head coach Ricky Dandan as far as being a PBA coach is concerned. San Miguel Beer ran away with another win, this time at the expense of the NLEX Road Warriors. However, the showdown had anxious moments with several incidents that added a bit of color. Chris Gavina, a virtual unknown, when he first called the shots for Kia/ Mahindra, has stepped down as head coach for Kia Picanto. Tasked to take over will be veteran coach Ricky Dandan. 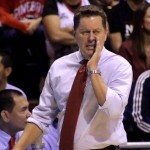 Can Tim Cone handle two coaching jobs? The DLSU Green Archers start their search for Aldin Ayo’s successor and the list includes the name of Ginebra Head Coach Tim Cone. 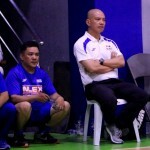 The NLEX Road Warriors have so far remained perfect, winning their first two assignments. They won over Kia Picanto handily (119-115) and then turned back GlobalPort Batang Pier. It is clear that the player that is standing out is rookie Kiefer Ravena.